Buffalo offers a widely varied skyline. This photo of downtown provides a prominent view of city hall. This photo of Main Street in Medina also shows the historic Erie Barge Canal. Medina is also Andrew's home town. Drawn somewhere between 1821 and 1841, this map shows the divisions of the Holland Land Purchase. Buffalo offers great returns on income property, such as this duplex located on Hertel Ave.
Western NY offers many different flavors for you to enjoy, such as the fine brews at Flying Bison Brewing Company, located in Buffalo, NY. Freddie Mac reports that the average U.S. rate on both 15-year and 30-year fixed rate mortgages remain unchanged for a second week. Rates are currently as low as 3.53% as of February 14, 2013. The rate on the 15-year fixed mortgage stayed at 2.77 percent for a second week. The record low is 2.63 percent. 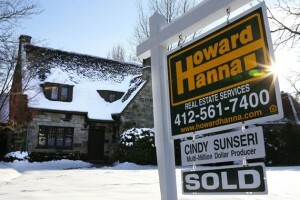 The slowly improving housing markets are gaining with the help of low interest mortgages. Although the increased housing demand is boosting new home construction, many people are still unable to take advantage of the low rates due to blemished credit or large down payments.